It's difficult to tell where the rhizome will lead you. So I'm studying prepositions, and learning some Sunday School lessons along the way. Once you take rhizomatic learning seriously, then it gets out of control quickly, as rhizomes will do. As Faulkner once said of writing novels, you just follow the main characters, scribbling furiously. I was in a video chat with Frances Bell, Simon Ensor, and Terry Elliot last Friday, and along the way, Frances brought up the issue of Gamergate, which at first did not ring a bell with me, but then I looked it up and realized that I had been vaguely aware of the issue, though certainly not in command of the specifics. I've tried to find a neutral, balanced account of the issue, but it is too heated at the moment, so I'll refer you to the Wikipedia article Gamergate controversy, which may not be unbiased, but at least its biases are being publicly discussed and are perhaps correctable if anyone wants to jump in. At any rate, I don't want to talk about Gamergate; rather, I'm using it to explore the ethical and power implications of connectivity especially as expressed through prepositions. Let me start with my own bias: I generally think that connectivity is a good thing, a positive thing. I like it before I even think about it. Other people do not. I'm a tree hugger and people hugger; others are not. When I think of how prepositions connect entities within a sentence and how the meaning of the preposition depends almost entirely on the relationship that it is establishing and mapping, I am happy to the point that I tend to overlook the dark side: not all connections are good, positive, useful, productive. Some connections are damaging, and this dark side of connecting is what Gamergate seems to be about. In some ways, then, prepositions are the bit of technology—the routers and wires and protocols—that connect people, mostly for good, but way too often for bad. See? I told you this would be a Sunday School lesson about good and bad. So how does connecting go bad? Or is that the wrong question? Is connecting inherently good or bad, or is the value of a connection worked out in some other dynamic. I also happened to recently read Iain McGilchrist's The Divided Brain and the Search for Meaning: Why are we so unhappy? (2012), which provides a shorter (10,000 words) version of his wonderful book The Master and His Emissary (2009), and this has given me a way to think about connectivity and our ways of emerging in the world and engaging the world and how we so often do awful things. Basically, McGilchrist claims that the divided brain has different ways of viewing the world—loosely associated with right and left hemispheres—and both are necessary for creating a workable world view. Loss of either view can impair the way we humans interact with the world, leaving us and those around us unhappy, if not damaged. We humans want to connect to the world, but these connections, our experiences of the world, are "mediated by neural tissue, a lot of it in the brain, and … that neural tissue inevitably governs the nature of, indeed places constraints upon, what it is we are able to find in the world, in predictable ways. … We can only know the world as we have inevitably shaped it by the nature of our attention." Thus, our realities are a joint production of the interactions between the world and what it brings and our brains and what they bring. "We bring about a world in consciousness that is partly what is given, and partly what we bring, something that comes into being through this particular conjunction and no other. And the key to this is the kind of attention we pay to the world." This leads to a circular causality: "We make the world we live in by attending to it in a certain way, by our disposition towards it. Having done so, our experience of it then determines how we attend, and so on." The left hemisphere … plays the narrow-beam, precisely focussed, attention which enables us to get and grasp. … The right hemisphere underwrites sustained attention and vigilance for whatever may be, without preconception. Its attention is not in the service of manipulation, but in the service of connection, exploration and relation. … One way of looking at the difference would be to say that while the left hemisphere's raison d'être is to narrow things down to a certainty, the right hemisphere's is to open them up into possibility. In life, we need both. In fact for practical purposes, narrowing things down to a certainty, so that we can grasp them, is more helpful. … Another way of thinking of the difference between the hemispheres is to see the left hemisphere's world as tending towards fixity, whereas that of the right tends towards flow. The purpose of the left hemisphere is to allow us to manipulate the world, not to understand it. … the left hemisphere's world takes over once whatever it is is represented—literally 're-presented' after the fact: once it is familiar and known, as an instance of something, a concept. … The left hemisphere abstracts and generalizes … is not in touch with reality but with its representation of reality, which turns out to be a remarkably self-enclosed, self-referring system of tokens. … The left hemisphere sees truth as internal coherence of the system, not correspondence with the reality we experience. … [For] the left hemisphere, … it has to be 'either/or', black or white, never a life within a full color spectrum. The right hemisphere's world is present—or more precisely 'presences' to us, as Heidegger puts it … The right hemisphere's world remains truer to each embodied instance, and appreciates the unique. I'd say the defining quality of the right hemisphere's world is that it is all in relations, what I call 'betweenness'. This starts with its having a relationship with the world at large, not seeing it as a separate object, ripe for manipulation. … The right hemisphere is perfectly happy with 'both/and'. Both views are important, but for McGilchrist, and for me, the right brain view is superior, the master, and the left brain view is the master's emissary. "There is something of supreme value which each contributes to our experience of the world. But as far as understanding the world goes … the right hemisphere, the so-called minor hemisphere, is in fact the one that knows, and more importantly the one that understands, more." Some elegant research into gesture and speech reveals that thought begins and ends in the right hemisphere, passing through the necessary staging post of the left hemisphere, where it is put into serial sentences. … That middle stage, of making the parts temporarily explicit, before they are once more reintegrated into the whole, is crucial. Yet it cannot be the endpoint. … So the meaning of an utterance begins in the right hemisphere, is made explicit (literally folded out, or unfolded) in the left, and then the whole utterance needs to be 'returned' to the right hemisphere, where it is reintegrated with all that is implicit—tone, irony, metaphor, humor, and so on, as well as a feel of the context in which the utterance is to be understood. … Meaning emerges from engagement with the world, not from abstract contemplation of it. … It comes from the world as process, not from the world as a thing, and relies on patient and consistent attention to whatever might remind us of what meaning might be like. The left hemisphere is not in touch with the world. It is demonstrably self-deceiving, and confabulates—makes up a story, when it cannot understand something, and tells it with conviction. … Unlike the right hemisphere, which tends toward self-doubt, it takes a distinctly flattering view of its own capabilities.…It is not reasonable. It is angry when challenged, dismisses evidence it doesn't like or can't understand, and is unreasonably sure of its own rightness. It is not good at understanding the world. Its attention is narrow, its vision myopic, and it can't see how the parts fit together. It is good for only one thing—manipulating the world. To return to Gamergate and to prepositions, this inherent and untempered desire of some people to manipulate the world for their own ends seems to characterize the abuse that has driven other people from the commons of the Internet to avoid the attack. When we do not temper our desire to manipulate, then we become locked in our own world, self-deceiving, unreasonable, angry, self-righteous, myopic, disconnected from the world and from the hurt that we cause in that world, and capable of great cruelty and violence—whether intentional or accidental. Extended hands and prepositions both desire to connect, but connection that is not framed and guided by relationship is only manipulation, and manipulation without mutually nurturing relationship is violence and aggression. I think I have achieved some internal consistency in this post (a left brain ability), so now let me return to the right brain connections to the real world that started this post. I recall an issue in Rhizo14 when someone insisted that if people were going to discuss Deleuze and Guattari then they should have read them first. Some Rhizoers thought this reasonable advice, but others thought that it was elitist and exclusive. Such disagreements happen in social networks, and we are all capable of being drawn into them. From this distance now, it seems to me that the initial person was trying to manipulate the conversation to their ends, recommending rules that they likely believed would elevate the conversation to a more productive and scholarly level. I can hardly disagree with this intent, and though I have come to appreciate the conversation that has, in fact, emerged in Rhizo14, I still miss talking about Deleuze and Guattari. Anyway and unfortunately, there was not enough support from a long and cultivated relationship, not enough good faith, to help others overcome the seeming exclusion implied in this statement, an exclusion probably not intended by the author, but certainly felt by the audience. This is a great misfortune, as it caused some to disconnect from Rhizo14. Fortunately for me, and for reasons that I cannot quite grasp, I have developed a rich network of relationships with many Rhizoers which allow me to be of use to them and to make use of them in return. For instance, I am manipulating the auto-ethnography to my personal and professional ends, BUT returning to the group what I make of it. I think I am using left brain and right brain, and I think that will cultivate rich relationships that will become even more useful and enjoyable to me. Almost all of us in Rhizo14 have written things that confused others and that could be construed into an insult, but we seem to have developed more faith in our continuing relationships. Basically, we are convinced that our connections are for mutual relationship and not simply for manipulation; thus, we can continue dancing even though we occasionally step on each other's toes. It takes some balance, but I find it worth doing. Conversations on Science, Culture, and Time (1995) by Michel Serres with Bruno Latour. A discussion of how this idea emerged in the conversation between Serres and Latour will clarify, I think, why the prepositions appeal to me so much. First, some context: the book is a record of conversations in which Latour questions Serres to learn more about his methods, with the hope of clarifying Serres' often confusing writing. I had the notion that Latour was hoping to clarify for himself his own fascination with Serres and thereby clarify Serres for others. Latour begins with Serres' early years at school and pushes through to his latest works. If you want to tackle Serres' work, then you should read Latour on Serres. I find it most enlightening. The short section about prepositions arises in The Third Conversation: Demonstration and Interpretation. Latour starts this chapter by saying his "questions today will focus on formal proof, on demonstration—on what enables you [Serres] to decide whether an interpretation you offer is right or not" (77) [italics in the original distinguish Latour from Serres]. Serres begins with a very pragmatic, almost utilitarian view of philosophical demonstration and interpretation by insisting that an interpretation should address a specific problem, usually a problematic text, with local tools to clarify the obscurity. If the text becomes more clear, then the interpretation is useful, or good. If not, then the interpretation is not so useful. Serres gives an example by clarifying a sonnet by Verlaine, using the modern concepts of coenesthesia and random noise to illuminate the crazy path of the wasp in the poem. He explains, "I've never proposed an interpretation nor posed a question without there first being a problem (78) … The moment you bring transparency and clarity to a problem, the interpretation is probably a good one; what was inexplicable becomes illuminated" (79). I think this points to the first of the big problems with Serres' writing that Latour uncovers: Serres strips his writing of context, including scholarly context, choosing to work in the desert. To use the futbol metaphor that I've used before: Serres is looking for the space on the field, the empty place where he can have a chance at being creative. This space becomes important both for explaining Serres and for explaining why readers find him so difficult. Serres refuses to supply much of the context for his writing, shifting that burden to the reader. Given that Serres' context is encyclopedic, covering the arts and sciences from ancient times to the modern, this is an awful burden for most readers, who simply give up trying to understand him. Serres, then, wants to play his ball into open space, free from the already fixed positions and strategies in the crowded part of the field, free to engage whatever presents itself in an open space with whatever resources he finds to hand, or to foot as the case may be. Any soccer player will tell you that creating and playing into space is a difficult concept to learn, and only the most accomplished players master it. The analogy may hold for philosophers, as Serres insists, but following an accomplished player into open, empty space makes for difficult futbol and even more difficult reading, and this is the source of the difficulty in reading Serres, in playing his game. I apologize for the long quote, but Serres says it better than I can. Because Serres plays into open space, he must invent the game anew, facing a local situation—a configuration of ball, players, field, and trajectories—not quite like any generalized configuration he has ever faced before or even trained for. And in that instance when engaging the open space, the creative player must bring all that she has learned of the game and simultaneously must forget, or transcend, all that she has learned to engage this new game that space has opened to her. 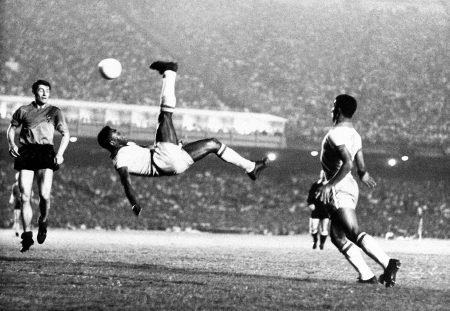 It is in this moment that a supremely creative player such as Pele will do the totally new and unpredictable and invent the overhead bicycle kick that will become a part of the standard repertoire of all skilled players after him. Pele, of course, was never trained to perform this kick, but he was prepared for this kick through his training. He was poised, then, between the rigors of his exhaustive training and vast experience and the freedom of forgetting his training and going beyond it. This, I think, is what Serres hopes for philosophy, at least for his philosophy. So what does this have to do with prepositions? Well, this brings us to the second great difficulty in reading Serres that Latour uncovers: Serres' explications, commentaries, and analyses are dynamic. His writing focuses on unstable, unfixed prepositions rather than on the traditional philosophical focus on substantives and verbals. This gives Serres' writing a dynamic quality that many readers find jumpy, jittery, and confusing. They are accustomed to looking for the substantive (being, nothingness, gender, connectivism, Marxism, etc.) that identifies Serres' thought, that places him within the context that he's trying to avoid. Prepositions don't fix thought; rather, they trace dynamic, shifting arcs and trajectories among concepts, pulling them out of their fixed orbits and flinging them into the asteroid belt. To see how, I want to focus on the final sentence quoted above: A cluster of highly different relations becomes a body. This is where prepositions come into play. I need to start with an image. For instance, think of futbol as a cluster of relations (players, ball, field) that becomes a body (a game). Think of Rhizo14 as a cluster of relations (mostly scholars) that becomes a body (a MOOC of sorts). Think of this blog post as a cluster of relations (words, sentences, concepts) that becomes a body (a post). In each case, we start with an open space—an empty field, open class, or blank screen—but soon enough, games deterritorialize and reterritorialize into this space: the ball arrives on an arc, a trajectory, a first and then second player, each on different trajectories, the field itself begins to emerge with more relevant and pressing boundaries. Similarly for Rhizo14, scholars arrive from their different trajectories and intersect at different space/times across the Net, finding their own shape and dynamics within various space. Likewise for this post: writers, readers, and words arrive on different trajectories, concepts, actors (substantives) and actions (verbs) appear on different arcs and clusterings, and the post itself begins to emerge with more relevant and pressing boundaries, finding its own shape, both familiar and unique, within the boundaries of the screen. The skillful player, the philosopher, engages the new relationships emerging and creates a new game that is similar enough for all her training to be useful but new enough to demand that she transcend her training. In writing—this post for instance—prepositions trace the relations, the movement of the ball, and as such, they mean almost nothing prior to the movement and the emerging relation. They have almost no meaning, which means they can assume almost any meaning. As Serres says, "Do you notice that, in relation to other parts of speech, the preposition has almost all meaning and almost none? It simultaneously has the maximum and minimum of meaning, exactly like a variable in classical analysis" (106). To my way of thinking, a preposition brings just enough DNA to unpack into a somewhat new meaning each time it is used to trace the dynamic connection between or among substantives. Like X in math, a preposition has DNA, a history of usage and meaning, but in any particular formula, it can assume a variety of meanings depending on the operations, operands, and relations it is tracing. The DNA, the dictionary definition, is the least meaning, the least one can say of X or a preposition. How the DNA unpacks as it zips among all its dynamic relationships is where most of its meaning emerges. For Serres, all ideas can be considered and connected (think rhizomatically, here, for as Deleuze and Guattari say, "any point of a rhizome can be connected to anything other, and must be" (A Thousand Plateaus, 7)), and the connections and relations are more important for Serres than are the substantives. This kind of topographical dynamism, then, allows Serres to connect the ritual of human sacrifice to the ancient god Baal to the Challenger disaster, but this greatly confuses (and probably offends) many readers who see no connection between the senseless murder of innocent people to appease a blood-thirsty god on one hand and technological progress and heroic death on the other. In his open spaces, Serres can trace a connection between these two events. Serres speaks of angels and Hermes as the dynamic messengers that map the connections among all the things and concepts of the world. Prepositions, then, are the angels of language that connect and map the connections among our concepts, and these fluctuating, dynamic connections interest Serres more than the concepts themselves. What does this say about Rhizo14 and the auto-ethnography? It provides me a stance toward Rhizo14 and toward writing the auto-ethnography. I want to begin with a problem, a variable X that needs solving, but I don't want to bring the problem to the auto-ethnography. Rather, I want the problem to arise from the auto-ethnography itself. This means gazing at the auto-ethnography, meditating on it. It's something like staring into a cloud chamber in the Large Hadron Collider: observing the particles that flash and arc, following their trajectories, and noting those that connect with others and those that don't connect at all. Looking for patterns, and noting where I can see patterns (create meaning) and where I cannot see patterns. The no-patterns are problems for me, but I'm confident that answers, the patterns, are contained within the auto-ethnography that will illuminate an issue if I can assemble the elements and map the relations among them. I can see the patterns emerge if I will use the terms, the tools, and the relations at hand within the auto-ethnography itself to conduct a local interpretation which may just lead to a global demonstration, to some knowledge that can be carried beyond Rhizo14. Also, I want to avoid bringing an agenda or theory to work on the Rhizo14 auto-ethnography. Like Serres, I want to avoid "a divine sun that sheds light on everything, with a beginning that will deploy itself in history … or with a principle—in order to deduce, through logic, a generalized logos that will confer meaning on it and establish the rules of the game for an organized debate" (103). I want to avoid especially connectivism, the educational theory that has most attracted me over the past few years. Sure, I can over-code Rhizo14 with connectivism—or constructivism, behaviorism, actor-network theory, or a dozen other isms, but I want to avoid that. I want to make a lateral move, both prepared by and forgetting what I know. I do this because a prepared theory can blanch a landscape, rendering it totally in the light of the theory. Serres makes a striking comparison between a given theory and an atomic bomb: the light of the exploding bomb illuminates all of the landscape below it, destroying all local detail and turning it into a featureless plain, under one sun, one explanation, one point of view. Even as agile a theory as connectivism can eliminate some important details in Rhizo14 that may be obscured, rubbed out in the brilliance of its application. Rather, I want to look at what's there, follow the prepositions along the relations that they trace, looking for the elements that pull Rhizo14 together into an assemblage (again, note the connections to Deleuze and Guattari). I want to follow the prepositions until a cluster of highly different relations becomes a body. What is here? What trajectories and relations? Both Maha and Sarah are playing into a new and open space. Maha is on a trajectory of thinking and writing about Rhizo14 ever since it started, but she's hitting some turbulence with her writing in late February, 2014, as Rhizo14 is formally ending. Sarah's interest in Rhizo14 traces from the early arc of her PhD program and a joint effort of her university with FutureLearn. Both, then, engage the same ball, Rhizo14, but they are tracing different trajectories: one from a research agenda and one from a graduate program and professional obligations. One is having issues handling the ball just now, the other seems comfortable. With just two sentences from two Rhizo14 participants, I'm already forming a quite complex cluster of highly different relations that become a body. You can see the angels in red in the two sentences above and how they trace the complex connections within just those two sentences. I hope to follow the prepositions throughout all the Rhizo14 auto-ethnography, using the Voyant tools to trace the totality of paths. As you might imagine, I can go lots of different ways, but I first want to map out the total track of the ball (Rhizo14) through the entire game to see if I can map how each participant clusters about the ball. I have faith that some patterns will emerge and that they will tell me things that I don't know now. Obviously, I am learning anew, with new tools, and I find this most exciting. About as much fun as I have had in a long time, and I thank especially Maha and Sarah for thinking to do the Rhizo-14 auto-ethnography and making it happen. I know others have helped as well, but I think those two have driven the effort. Good job.